First Line: If you are interested in stories with happy endings, you would be better off reading some other book. Violet, Klaus, and Sunny had loving parents at one point. Until a fire destroyed their beautiful home along with their wonderful parents. Now, they have become the responsibility of a distant relative, Count Olaf. From the moment the children were put into his custody, life has been a complete opposite of what the Baudelaire children once had. Now they are forced to do chores, cook, and they are forced to live in a small bedroom with one rickety bed. Things only get worse at the children find out what Klaus is really after and the plans he has to obtain his goal. 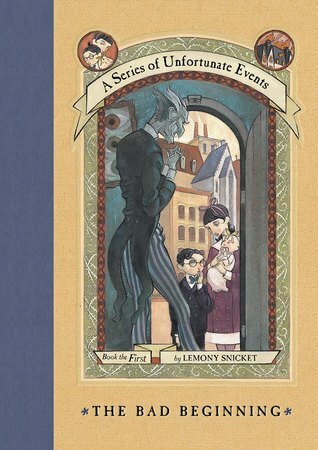 I have watched the Series of Unfortunate Events movie and I loved it. But it has been a while since I have seen it, so I don’t know what has changed from the books to the movies. I am actually grateful for this. The first book was such a fantastic, but sad story. At moments I wanted to reach into the book and pull these poor kids out of the mess they had found themselves in. There are all kinds of warnings in the book that it’s not a happy story, and it is far from a happy story. There are moments where the children have a second of happiness but something always comes to take that away from them. What I loved most about this book is how the children stay together through it all and try so hard to comfort one another. Their parents have been ripped away from them, as well as the only life they have ever known, but they still have one another. It’s wonderful to read a story about siblings who actually get along and don’t let the stress of a horrible situation break them apart. They never seem to lose hope and while it is a sad book, the message is beautiful. I can’t wait to start reading the next book. Aside from the story itself, I want to say how beautiful the book itself is. From the gorgeous cover art, to the wonderful illustrations throughout the book. It has been a while since I have read a book with illustrations in the book, and it brings the magic to a new level when reading as an adult.